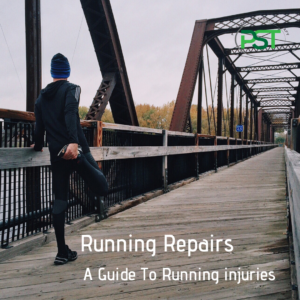 What are the 5 most common running injuries? 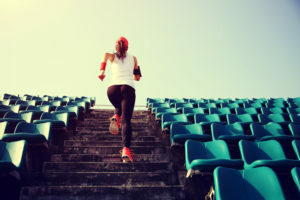 Running is such an easy form of exercise to get into and a fundamental requirement for a huge range of sports that it is no surprise that a huge number of people run as part of their fitness regime. Running injuries are very common with a figure of around 70% of those who run getting an injury of some sort every year. This isn’t because running is particularly risky rather it’s more that it’s very easy just to stick your trainers on and get cracking. As a result of the very easy access to using running as a means of getting fit etc people tend to do it without much thought as to what they are doing. When I say this I am talking about how much they are doing in terms of either volume, intensity of effort and also in terms of the skill of running. Whilst I would agree that we are all born to run not all of us are going to run well straight away and we tend to forget it is actually quite a demanding activity. Training load, the volume and intensity bit above, is generally the biggest factor in the causes of injury whilst the actual skill sits about 3rd but its importance increases as you get better at it and look to make more demands of yourself, the better your form the more likely you are to distribute the stress over the correct areas. So what are the most common running injuries? Generally this is very much an overuse use injury that can be in one of two areas in the tendon. The classic symptoms are in the body of the tendon and are caused by the tendon having to do too much in terms of the tensile loading of the tendon or more simply that you have been more running, be it too much mileage or too many intervals, than the tendon can recover from. The other area is where the pain is around where it inserts into your heel. This is caused by a compressive overload where the tendon is being pulled against the heel as you go into dorsi flexion, the point where you are pushing off. This tends to be caused by a sudden increase in the amount of hill work being done be it more runs over hilly terrain or, and more commonly, a jump in the volume of hill reps. In both cases some form of rest is a good idea in the acute stage but how much rest depends on how severe things are. If things are very sore the best thing you can do is switch to the bike or rower for your sessions and give things a chance to calm down without having a negative impact on your conditioning. Where there is more of an ache the rest can be more about leaving sufficient time between runs, so making sure you have rest day between each one should be enough. With compressive tendinopathy regardless of the severity hill reps should be dropped and hill running in general minimised. Calf raises are highly recommended, especially the seated version, and done 3x per week gradually increasing the weight used and dropping the reps. Injury to soft tissues/muscles account for between 10-30% of all injuries in sport and hamstring tears are the most common of these. The hamstring acts as both a knee flexor and a hip extensor as well as contributing, to a lesser extent, to external rotation of both the hip and knee. The most common injury to the hamstrings, approximately 70% of all injuries, occurs to the biceps femoris, the lateral of the 3 hamstrings. The most common time for tears to occur is during high speed running. The point where the tear happens is at the end of the swing phase where the hamstring is decelerating the leg in readiness for ground contact. At this point the muscle is required to both lengthen, as the hip flexes, and contract, as the knee extends. . In these cases the tear is normally to the long head of biceps femoris and occurs around the tendinous junction where the muscle is at it weakest. With any grade of tear it is best to get professional help to rehab ensure that the injury heals well but prevention is better than a cure so what can we do to help reduce the chance of injuring ourselves in the first place. To begin with we want to make sure that our hamstrings are as strong as possible thereby giving us the best chance of overloading them. One of the best exercises for this are Nordic Hamstring curls. The great thing about nordics is that they do a really good job of training the very movement that can cause hamstring tears. The aim here is to be able to first lower yourself to the floor under control then progress to being able to do both eccentric and concentric portions. Single leg RDL’s are another great exercise as they not only provide a strong stimulus to the hamstrings but also makes demands on our ability to control the movement around the hip so as well as getting strong it aids our co-ordination. Ensuring that you warm up well is invaluable as a preventative measure. Taking the time to move from slow movements such as bridges, lunges, squats etc faster movements such as gentle strides. If you are doing any kind of speed session then ensuring that you move from gentle accelerations right up to full speed running is essential. Increasing the intensity ensures that the both the muscles and nervous system are primed for the hard work that is to come. The pain of PFP is present in and surrounding the tissues between the patella and the femur. The cause of the pain can be something of a mystery as it rarely develops quickly and isn’t the result of a traumatic incident the way a ligament tear is. Squatting, lunging, kneeling, going down stairs or running downhill are the types of activity that make the symptoms worse. These are all high load activities that put a lot of stress on or through the area. Sitting with the knee flexed is the exception to this. Sitting with the knee flexed for long periods is also likely to cause pain. The British army carried out a study on 1500 recruits over a 14 week training period showed that simply adding in 4 stretches, hamstrings, quads, IT band and calves, and 4 strengthening exercises, step ups, lunges, single leg squats and hip abduction. These are a nice broad spectrum of exercises that target the areas that we know have an impact on the knee. The results of the study showed a 75% reduction in the incidence of anterior knee pain in the group that did the exercises and stretches. The illiotibial band is a thick, fibrous length of connective tissue that runs from the tensor fascia lata and glute max to the lateral condyle of the tibia. Illiotibial band syndrome is a result of irritation of the distal end of the ITB as it attaches to the tibia. This results in inflammation of this lower portion of the tendon and subsequent pain and affects around 5-6% of distance runners. It is caused by a exceeding the combination of load and frequency that you are able to tolerate. The ITB is supposed to be to do it’s job, but if the right combination of tension, load (amount of stress put through it) and the frequency of it happen are correct you end up with ITB syndrome. Prevention is better than cure so managing your training load is of primary importance and when looking to increase this, be it overall volume or intensity, make sure that any increases area maximum of 10% week on week. Ensure that you have at least 2 days where you don’t run at all, rest really is your friend, and make one of them after your longest run. Try to get off road a little if you can, the change in surface can be a massive boon in terms of spreading the stresses through the body. Outside of running itself try to do some strength training regularly, a bit more through the winter and a bit less through the summer. But I’m a runner I hear you cry. Getting stronger has rarely affected performance in any way unless it was done to the exclusion of the primary activity or focus. Some general lower body work will help in many ways and not just in reducing the chances of ITB issues. One of the most common issues that runners can suffer from, affect around 8% of runners The plantar fascia is a thick band that runs across the sole of the foot from base of the toes to the heel and plays a very important role in creating stiffness in the foot. The exact cause of plantar fasciitis is a hard one to nail down and tends to come down to “simple” training error where you have exceeded your ability to adapt to the stress you are placing on the tissue, a rubbish but honest answer. Looking at it in terms of prevention then everything starts with training load management since the main cause seems to be training error, doing too much too soon. From here we want to make sure that the our legs are strong enough for the task at hand so some lower body strength training at least 1/week is a must. After this you can consider looking at technique work, something that you shouldn’t be ignoring anyway, as the more you ask of yourself the more important that this becomes. As with all injuries if you are unfortunate enough to suffer one then the best thing you can do is get it checked out by a professional. Whilst Google is great putting the appropriate rehab program put in place requires more than watching a couple of youtube videos. Identifying what injury you have so that the correct work can be done requires an assessment. Read a bit more about it here. As an overall view on dealing with any of these injuries the best place to start is before they happen and what you can do to reduce the chances of them occurring in the first place. These guidelines are a good place to start when looking to reduce your injury risk. Don’t increase the overall volume by more than 10% a week. Stick to a rough 80/20 split where 80% of the training is done at a low intensity and the other 20% split between the likes of tempo runs and various forms of interval training. Keep an eye on work and other areas of potential stress. If you know you are going to have a busy period at work then dial back on the hard work and even the overall volume to account for the extra stress elsewhere. Rest is very important. Don’t run on 2 days of the week. This is especially important when in your 40’s and beyond with regards to tendon injuries. Do some strength training. It doesn’t need to be a huge amount of work, a small amount of work can go a long way. Think twice a week in winter and once a week in summer or off season/in season. Previous PostPrevious When have I injured myself and when is it the brain being careful? Next PostNext The best recovery tool in the world.